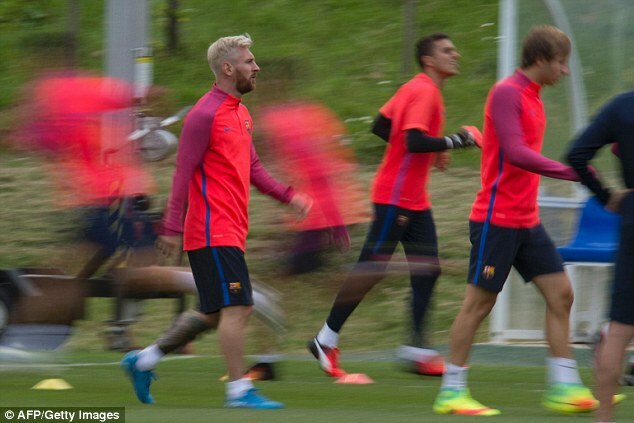 Barcelona’s pre-season regime moved north on Monday, as the squad embarked on a trip to England for a six-day training camp at St George’s Park in Burton-upon-Trent. 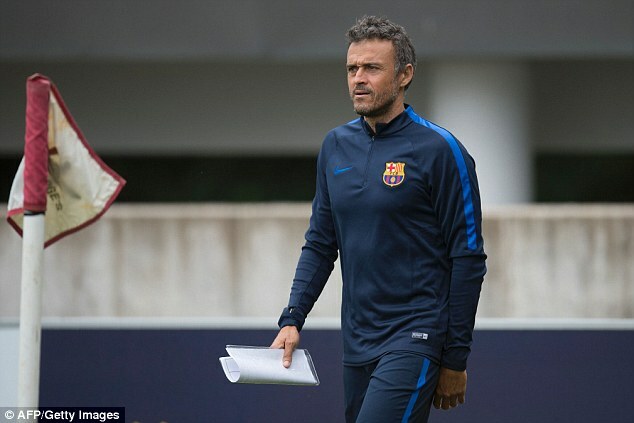 Manager Luis Enrique led his side out at the Football Association’s national football centre as they prepare for their pre-season opener against Celtic in Dublin. 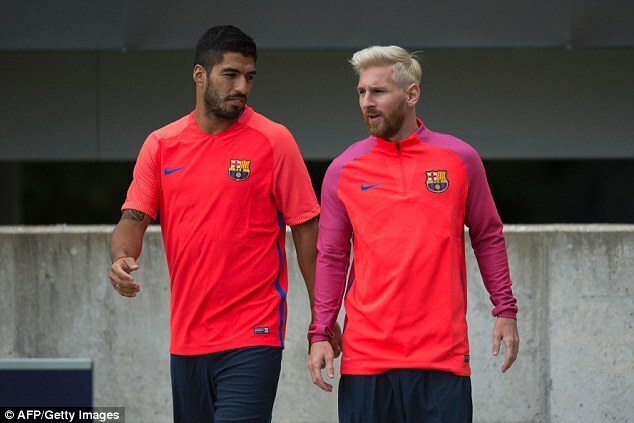 Argentine maestro Lionel Messi and Luis Suarez looked inseparable at the session as they got ready for Saturday night’s International Champions Cup friendly at the Aviva Stadium. 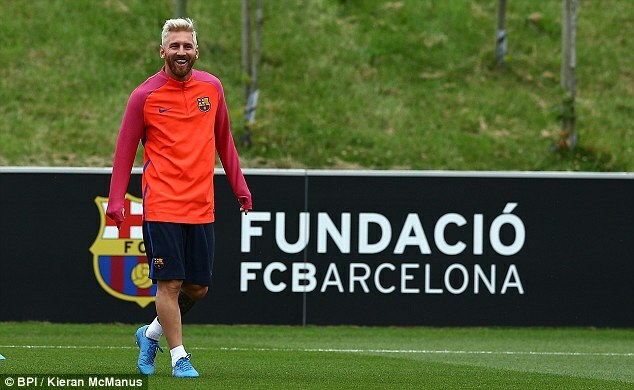 Masip, Turan, Suarez, Messi, Munir, Sergi Roberto, Aleix Vidal, Mathieu, Denis, Montoya, Tello, Samper, Jose Suarez, Josep Martinez, Marlon, Martinez, Borja Lopez, Carbonell, Gumbau, Alena, Nili, Alfaro, Camara and Mujica. The team’s two-hour flight from Barcelona-El Prat landed at Birmingham Airport just before midday on Monday, before they headed 34 miles north of Birmingham to their new base. Eleven players, plus Cristian Tello and Martin Montoya, made the trip and joining them were 12 players from the Barca B side and the Under 19 team. 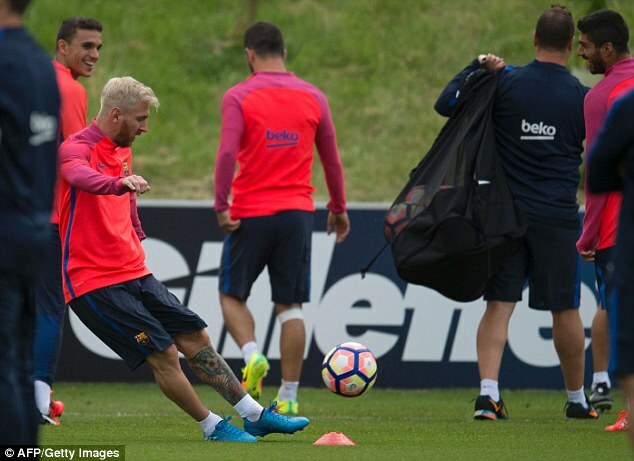 Messi – sporting his new bleached-blond hairstyle – ended his holiday early to return to training with his team-mates, and looked happy with his decision as he hung out with Uruguayan hitman Suarez on an overcast day in Staffordshire. The 29-year-old’s action from last season only ended on June 26 – 29 days before his St George’s Park outing – with Argentina’s Copa America final defeat by Chile. 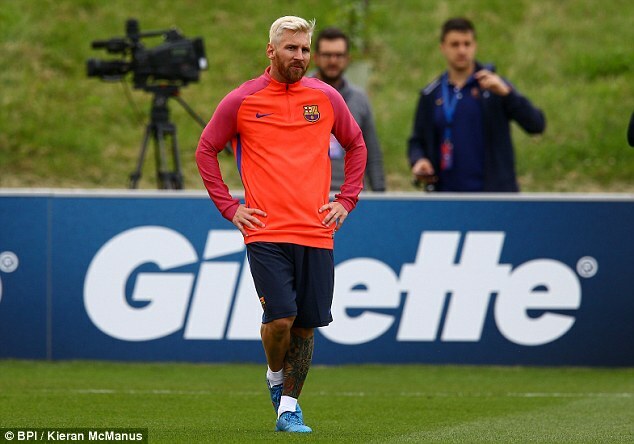 Messi chose to call time on his international career following his latest final heartbreak, having also lost on the showpiece occasion at the 2015 Copa America and the 2014 World Cup. But it seems the Ballon d’Or holder is keen to get back to club business at least after calling time early on his short summer break, which was mainly spent in Ibiza. 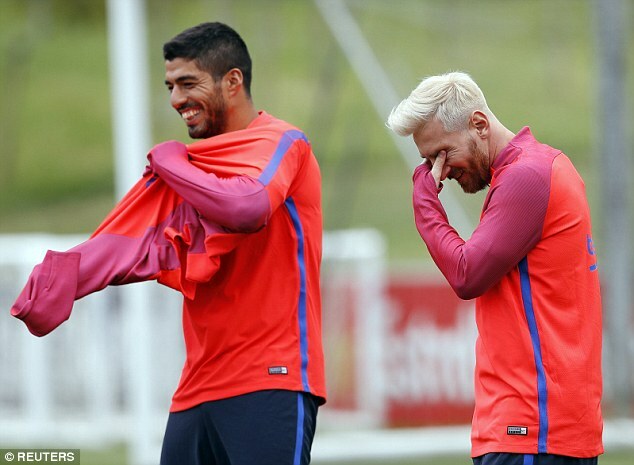 While Messi and Suarez were present at Burton the final part of Barca’s famous ‘MSN’ trident, Neymar, was absent. The Brazilian forward is currently preparing for the Olympic football tournament in his homeland after club and country struck a deal to leave him out of the Copa but to send the star to Rio. 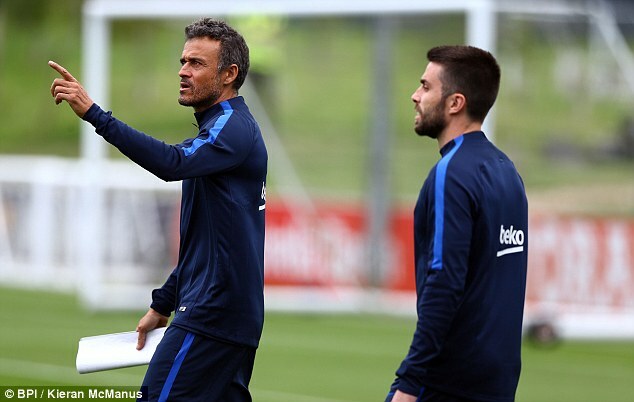 Turkish playmaker Arda Turan made the trip to England as well, while Adriano, with permission from the Barca management team ahead of an expected move to Besiktas, did not. 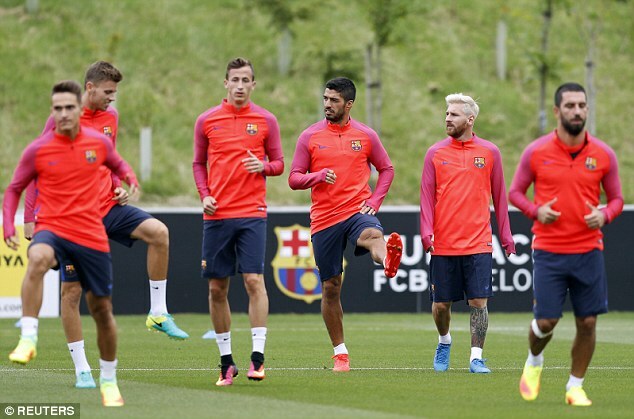 Aleix Vidal, Jeremy Mathieu and Sergi Roberto are also among the senior members of Enrique’s squad to have travelled.